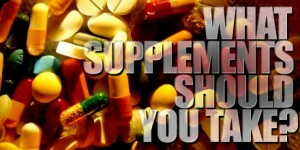 What Supplement’s in your diet are a must. Almost everyone is familiar with the scams and fads “out there.” We all know about the apple cider vinegar’s, the shark cartilages, and the latest witch doctor brews. Unfortunately for those new to the bodybuilding lifestyle, what is less well known are tried, true methods of exercise, and tried, true and TRUSTED supplements and supplement companies. When constructing a supplement program one should first give attention to the careful selection of a multi-vitamin. First and foremost consideration must be given to any potential allergies that you may have. Failure to select the correct multi-vitamin may result in an allergic reaction to the vitamins ingredients. In my particular situation, I have an allergy to the element nickel (Ni), as did my father before me. I have experienced allergic reaction to a multi-vitamin resulting from its nickel content. As a result, I experienced diarrhea, gastro-intestinal upset, and dull aching in my kidneys. Upon discontinuation of the vitamins, the symptoms dissipated. Given that no other alterations were made to my supplement or diet program, the multi-vitamin used is likely to have been the cause. Therefore, to avoid this unpleasant experience, it is suggested that one makes a note of any potential allergies that may exist, and carefully examine the ingredients on a multi-vitamin prior to purchase. Further, any other pre-existing medical conditions that one may have should be kept in mind while considering a multi-vitamin. For example, in the case of prostatitis [prostate enlargement that is interfering with the ability to pass urine], a multi-vitamin with a high zinc content [15mg or greater] is best avoided. Time-release versus non-time release is also something that one should consider. Time-released multi-vitamins are usually more expensive but provide considerable advantage as minerals and vitamins are released at a slower, but more steady rate. This allows for better retention, and an overall better value. There is little sense in spending money on a product, only to rid yourself of the vitamins as your urinate. Men and women require different dosages of minerals and vitamins. Resist the urge to think, “more is better.” It is not; precise is best when dealing with multi-vitamins. Glutamine is a standard issue for anyone considering a supplement purchase. In fact, Glutamine is so important and plays so many roles in the body if it’s a choice between Glutamine and the latest Whey supplement, Glutamine would be first choice. Hard training athletes need glutamine because the body is unable to make enough of it on its own when subject to intense and heavy training. BCAA’s [branch chain amino acids] are precursors to glutamine, but without an external supply of glutamine to satisfy the body’s needs, gains will be minimized. When one is under stress [when working out, for example] glutamine is released from the muscles, and this can result in dehydration. Dehydration, as many will know from research, leads to a catabolic state. High glutamine levels in the body will allow for greater protein synthesis and increased hydration, which will result in increases of lean tissue. Also, glutamine stimulates the pituitary gland in the brain; thereby increase available levels of Growth Hormone. A neurotransmitter known as Gamma Amino Butyric Acid [GABA] is also boosted, and this helps in recovery and relaxation. When considering a purchase of glutamine one should pay careful attention to the wording. Does the package say “free form” or “peptide bonded”? These are two important but very different phrases. Peptide-bonded glutamine is more stable than its free free-form counterpart. It is also more expensive. Peptide-bonded may be taken with food while free form is best taken on an empty stomach. Obtaining enough protein in the diet alone is often difficult. Theoretically it is possible. However, by relying exclusively on whole-food sources to obtain ones complete daily protein requirements, one risks the digestion of incomplete proteins, as well as placing undue stress upon the digestive tract. Therefore, to circumvent the previously mentioned difficulties, a protein powder is useful. When selecting a Whey protein product, careful attention should be given to the type of Whey protein contained in the can. Things to consider are: Yield, Functionality, Amino Acid Profile (BCAA – EAA ratio), WPI:WPC Ratio, Filler Percentage, Taste, Ease of use, Blendability, Digestibility, Functionality and results. Dextrose is beneficial when taken with Creatine, as it illicits an insulin spike, thereby shuttling more creatine into the intended target: the muscle. However, reducing the amount of dextrose, and introducing Whey protein into the mix may elicit a greater insulin spike. By doing this an insulin spike equivalent to using 90g of dextrose may be seen. Creatine is fairly cheap, and over the years its quality has improved considerably. Long gone are the days of Chinese creatine. Creatine monohydrate in the powder form is the recommended type, as attempts at stabilizing liquid creatine serums have not been met with success. ZMA is a supplement that may be considered a “basic” by some or an “accessory” by others. It is included here as a basic because it assists greatly in recovery and prevents muscle wasting resulting from a calorie-reduced diet. ZMA is a supplement that boosts natural testosterone levels to their maximum. It does this by employing a unique synergistic combination of three minerals [Zinc, Magnesium, Aspartate]. I include ZMA in my supplement regimen, and find is useful especially when on a fat-loss program. When on a strength and muscle-building program, ZMA is useful in that due to increase testosterone levels brought about by increased calories and its use, a great increase in strength can be seen. When on a fat-loss program, a thermogenic can greatly increase fat loss. Two popular brands are Hydroxycut and Xenadrine NRG. Having used both, I am in a position where I can recommend one or the other.